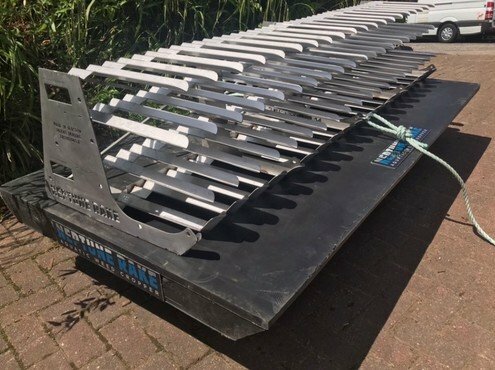 Neptune Rake is a lightweight, yet very robust tool for cropping emergent pond weed and dredging detritus from lake beds. It is light enough to carry by hand to any lake, over any terrain. 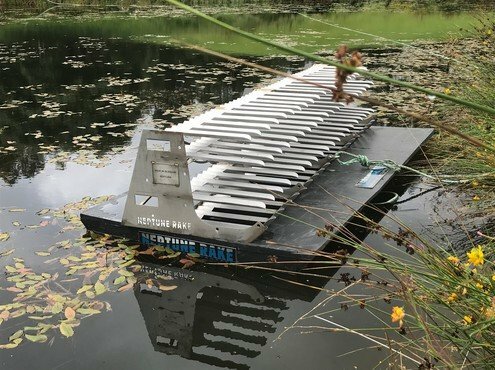 Back in 2014, Calum Gordon, director of Splash Gordon ltd realised that there was a real need to clear ponds and lochans of emergent weed and detritus. It can remove up to 10 tonne of weed and lake bed detritus in one day! It takes just ten minutes to set up the system, bolt the rake together, lay out gather rope to far shore, attach the winch to a suitable tree or ground anchor. The rake is sat on the float and the float is pulled to any area of any sized water body, it is easily deployed by pulling on both gather rope and winch rope, the rake slides off the float and lands on the lake floor. The winch is then used to haul the rake across the lake floor. The off-set tines of the rake force weed to zig zag up through the rake and jam, weeds are up rooted and cropped at their base, the rake also gathers detritus and sludge. 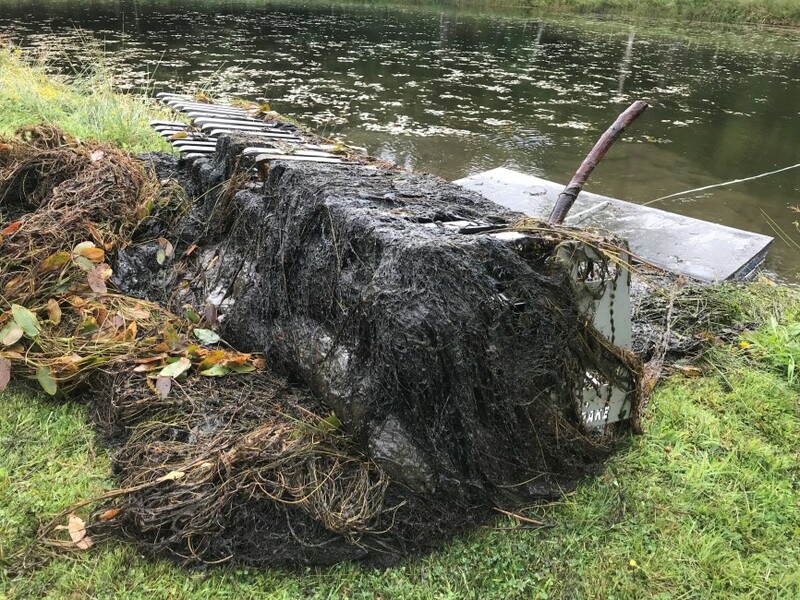 The winch hauls the loaded rake right up onto dry land, two men then simply tip it forwards to dump the weed then set it back on the float for the next haul. Mobile pond life has to opportunity to return to the pond un harmed. The kit includes the Portable Winch PCW5000, this is the best portable capstan winch on the market, it can pull a ton, or with block, two tons. Any land owner will find multiple uses for this winch from tree work to vehicle recovery, made in Canada and powered by a Honda engine its very reliable. The kit includes 220 metres of 12mm Seasteel rope, this has a 2-tonne breaking strain. Use this coil of rope for both winch and gather rope, cut to suit. You will need to form your own knots to attach gather rope to float and winch rope to the rake, a shackle is provided for the rake pulling point to prevent the rope chaffing. The kit includes a 2m by 1m Palziv foam float, this is incredibly tough closed cell foam, an adult can even use it as a paddle board if need be. Please use buoyancy aids where necessary. The rake is currently used at Shell Oils St Fergus gas terminal to keep their 1-acre fire pond clear of weed, it is also used at Dumfries House plus many other large estates.